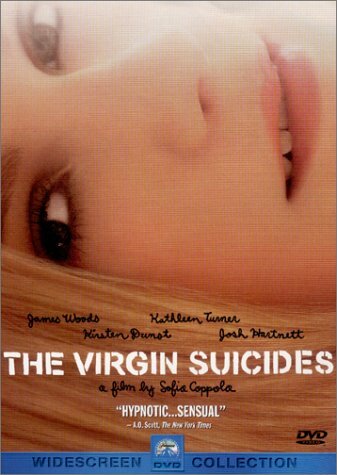 The Virgin Suicides is a sort of macabre tale dressed up in the innocent clothes of 70’s period piece. That is really a horrible description but there is also accuracy in it somewhere. It is about a family of five teenage daughters, a school teacher father and an overprotective mother. The story is told by a faceless narrator who seems to be the conglomerate of a group of friends whose life was changed, or at least directly influenced by this family. Even though the boys are represented by the narrator, the focal point is really the five girls. The family’s youngest girl commits suicide in the early minutes of the film and the rest of the time you are trying to figure out who’s going next and when. But this isn’t a horror movie and it even manages to not be horribly depressing. Just by the title you generally know what is going to happen and so you end up focussing on why the girls might want to die and trying to figure out what could have happened differently. But then you start getting distracted by the things that are going on and soon forget about the impending tragedy. One thing I noticed about this movie was the soundtrack. The music pieces were enjoyable, time period appropriate and a little offbeat. I also liked how every scene was enjoyable—the characters are all interesting and likable (even the ones you feel you shouldn’t like). I’ll say it again, despite the somewhat gothic title and subject matter, this movie was funny and endearing and almost heartwarming. I really enjoyed it.